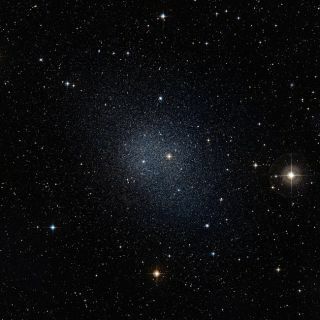 The Fornax dwarf galaxy is one of our Milky Way’s neighboring dwarf galaxies. The Milky Way is, like all large galaxies, thought to have formed from smaller galaxies in the early days of the Universe. These small galaxies should also contain many very old stars, just as the Milky Way does, and a team of astronomers has now shown that this is indeed the case. This image was composed from data from the Digitized Sky Survey 2.